Are you planning any type of event that requires sending invitations? If so, these tips might help you with the wording and tone. Whether it's a formal dinner party that requires people to dress up in their finest duds, an outdoor children's birthday party where guests may wear jeans or a baby christening where you expect people to wear church clothes, you'll need to follow a few simple guidelines. There are some things that all invitations should include. You'll want to let your guests know the purpose of the event (if there is one), the time (start and end), the place, special instructions (for example, costume party), and style (formal or casual). You should also ask your guests to RSVP so you are better able to plan. For a formal event, you want the invitation to match the tone. This is why many people will have them engraved or handwrite them. You may or may not use formal wording. The above example uses a formal tone. However, if you are more comfortable with "invite you to" rather than "request the pleasure of," that's fine. When inviting someone to a casual get-together, you may choose a more conversational tone. Another option is to state the facts. Whichever you choose, you'll want the same basic information. Hazel is turning eight, so come and celebrate with us! You don't need to include anything other than what is listed on one of the above invitations. However, if you don't want to receive gifts, You may use a simple statement such as "No gifts, please," or "In lieu of a gift, please donate to the local animal shelter." Or if the event is a fundraiser, you may state that. Although many brides and grooms like to include the name of their gift registries on the invitation, it isn't the proper thing to do. Instead, you may ask a close friend or relative to provide that information separately. Never ask for money in the invitation because it's crass and can be very off-putting. Check your guest list. You need to make sure you have enough invitations and a few extras. After all, someone from your original list may not be able to attend, giving you a spot for someone else you would like to invite. 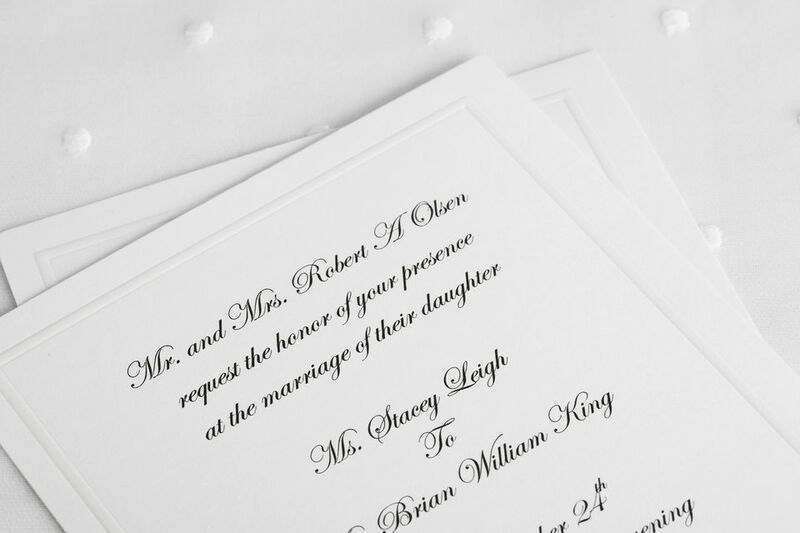 Whether you use professionally printed invitations or you handwrite them yourself, make sure you proofread them before you put them in the mail or hand deliver them. That is quite a bit easier than having to call everyone to correct a date, time, or address after they are mailed. Remember that not everyone knows the proper etiquette of sending an invitation, so don't get too upset if you receive one that doesn't follow these guidelines. Maintain a positive attitude when you send the RSVP to accept or decline the invitation. If you go, forget about the host's faux pas and have fun. After all, the party is a celebration, and you were honored with an invitation.